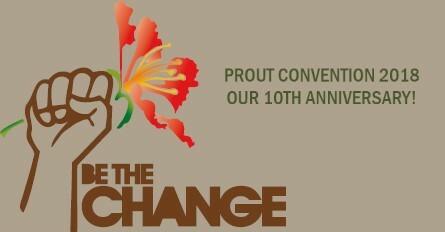 This year we are also celebrating the 10th Anniversary of the Prout Convention. We will look at what we have achieved over the last ten years and explore the challenges and opportunities which the next ten years hold out to us. For those new to Prout “PROUT” stands for “Progressive Utilization Theory”. It is an alternative socio-economic theory based on the worldview that humans and all of creation are part of a universal family on a common journey towards higher consciousness. As aware and knowledgeable members of the family we have a responsibility to safeguard the security and well-being of fellow family members. This is a spiritual worldview with strong social, economic and environmental implications. As such the Prout Convention is a blend of spiritual retreat, learning and inspiration for progressive change. Kiirtan (chanting) and meditation are at the core of the convention. Four sessions of kiirtan and meditation every day and two sessions of yoga asana practice create a strong spiritual flow. For those who love chanting, every retreat brings the opportunity to learn new melodies and hear old melodies played in a new way. Spiritual talks from teachers and experienced practitioners bring insight and inspiration and the evening cultural get-togethers offer a warm-hearted opportunity to enjoy the performances of our talented international family. Ananda Gaorii Master Unit (retreat center and organic farm) itself is constantly developing. We have a growing number of talented volunteers, we are making great progress in our garden, increasing our production and taking our products to market, and we are looking forward to showing off a new roof, new rooms and other improvements. There will be a complete child care program in the children’s tent and the enclosed children’s area with activities aimed at developing their sense of connectedness with all life and their own inner greatness and beauty. Trips to the nearby beach and forest will be offered along with special activities for teenagers. Ananda Gaorii has a combination of rooms, dormitories and grassy fields for camping (see www.anandagaorii.dk for more pics). Most of the rooms have double bunk beds while some of the dormitories have mattresses on the floor. Participants should bring their own sheets, sleeping bag, etc. Those who need more privacy and peace (and loud snorers) are encouraged to bring their own tent and camp (Note: We will set up some of Ananda Gaorii’s tents and make a limited number available for participants). Be sure to register early if you want to have a choice of accommodation. To register kindly: 1) pay the advanced booking fee (40 Euro/300 Dkk) or the full amount and then; 2) fill out the registration form. Space is limited (except for camping). Paying the advanced booking fee gives you the opportunity to secure your preferred accommodation and special needs if you have them. Note: Registration fee covers, accommodation, food and program participation. – Outside Europe: concessions will be available when registering in advance or at registration. NB! Please include the words “Prout Convention” in the message line. Sleeping bag/blanket, bedsheet, pillow, yoga mat, indoor slippers, notebook, pen, swim suit, towel, toiletries, sun cream, hat, sun glasses, notebook, pen, sports shoes, day pack. Trilokesha is in charge of pick-up from Vig. Please email him in advance at thorvaldurt@hotmail.com to tell him your approximate time of arrival. Please also call or sms him on (+45)29423037 just before you catch the train or bus from Holbaek. Then he will know to pick you up in half an hour. If you are arriving very late in the night you can stay overnight at the Ananda Marga Jagrti (Yoga Center) in Copenhagen. The address is Platanvej 30, Frederiksberg. Take bus 6A from Copenhagen Central Station five or six stops to Platanvej and walk back to the corner and turn left into Platanvej. We are the first house on the left. Bus 6A leaves from Vesterbrogade opposite Copenhagen Central Station immediately in front of Nordea Bank. If you need to contact our Copenhagen Center please call Paresh on +45 71667936.